It has remained confused all along about the cng issue, giving contradictory statements. Delhi government officials have been easy conduits of misleading information from those pro-industry factions that are looking for excuses to not implement the sc order. It began by selectively citing biased documents from the us , supplied by pro-diesel automakers, arguing that even the us is finding it difficult to move to cng . This was followed by a splurge of press statements claiming that cng conversion won't work. The first came in June 2000 from Delhi's lieutenant governor, Vijai Kapoor. Ramvir Singh Bidhuri, spokesperson of the Delhi Pradesh Congress Committee, was next. The transport minister, Parvez Hashmi, followed on July 17, 2000. Kapoor went to town with a study by the Harvard Centre for Risk Analysis, funded by Navistar International, a leading us trucking company. Hashmi went a step further to cite a study of the bus fleet across the us by the General Accounting Office (gao) on the status of alternative fuel use, including cng . The transport minister selected the part which mentions that the country has "a very small portion [5 per cent] of the transit bus fleet of 50,000" running on alternative fuels like cng. In an effort that can be described as nothing but deliberate, he did not mention the part which pointed out that one out of every five new buses being ordered across the us will be powered by alternative fuels, mostly natural gas. Quoting the gao report, Hashmi said the us experience with cng buses was poor. He conveniently ignored the part that says natural gas buses have a promising future and that they make up the majority of alternative fuel buses now in operation in the us . Even so, the us department of energy says the discussion material in the gao report "is loosely based on informal conversations and interviews that the gao had with a small industry group" and that "much of the report dwells on poor fleet experiences with early generation equipment from the late 1980s and early 1990s. It says the findings do not reflect current market conditions." The government argues that its industry bias has led gao to take the 'half empty glass' approach instead of a 'half full glass'. Hashmi's selective use of information smacks of some of the oldest disinformation tricks of the trade. International experience shows that moving to any new fuel is always beset with hurdles, especially the opposition from entrenched business interests. But most governments take strong, proactive measures to counter such opposition by raising public awareness. When similar attacks were launched in the us , the department of energy brought out a notification in April 2000 entitled 'Natural Gas Buses: Separating Myth from Fact'. The idea was to counter what the department calls 'industry folklore'. The Delhi government did not put in place financial incentives schemes, as mandated in the sc order, for autorickshaws and buses. The only incentive available to auto rickshaw and taxi operators is the one designed for phasing out 15-year-old commercial vehicles in Delhi. 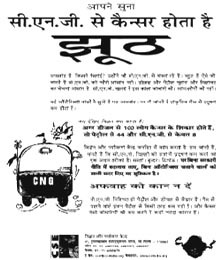 This isn't available to those who want to replace vehicles less than 15 years old with cng -powered ones.